Kristiansund is a city and municipality on the western coast of Norway, in the Nordmøre district of Møre og Romsdal county. It was officially awarded township status in 1742. 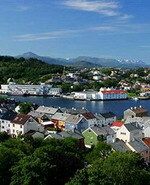 Kristiansund was established as a municipality on 1 January 1838 (see formannskapsdistrikt). The island and municipality of Grip was merged with Kristiansund on 1 January 1964. The island and municipality of Frei was merged with Kristiansund on 1 January 2008. The city borders Smøla to the northeast, Tustna to the east, and Averøy to the southwest. In the south, the island of "Nordlandet" borders the island of Frei which, since 2008, is a part of Kristiansund municipality. In the northwest the small island of Grip is located. Rica Hotel Kristiansund is a first-class business hotel in a central location on the quay in the oil city of Kristiansund. Short distance to shopping streets. With "Sundbåten" you can go to the 4 "countries" of the city. "Inland" the hotel has its own maritime jetty. Exquisite dishes and wines are served at the restaurant which is also famous for its Bacalao. The Sky Bar is located at the top of the hotel, naturally. Here you can really relax and enjoy the view. JP Clausens Vin & Pianobar is the in-place in town where you can enjoy snacks. Above the strait, the hotel has its own summer restaurant which serves à la carte menus, among other things. The hotel is placed right by the seaside in Kristiansund, where you will be able to enjoy a cup of coffe or a meal in open air in the summer. The hotel restaurant will serve lunch and dinner, with a strong element of local food and ingredients. Wireless Internet access throughout the hotel. The hotel is located in an area with high growth, with cafés, restaurants and art galleries as next door neighbours. Kristiansund and the surrounding area offers a multitude of exiting activities. Visit the old fishing village on the island Grip or explore the wild Atlantic scenery and the areas coastal history. Kristiansund is ideally located for a tour on the magnificent Atlantic Road (Atlanterhavsveien.) The Atlantic Road winds its way along the coast between Kristiansund and Molde. Make sure to stop and admire the unique scenery. Sandnes is a city and municipality in Rogaland county, Norway. It is part of the region of Jæren. The city is named after an old farm ("Sandnæs" 1723), since the city was built on its ground. The first element is sand which means "sand" or "sandy beach", the last element is nes which means "headland". The primary football team (Sandnes Ulf) is currently competing in the highest division of Norwegian professional football, Tippeligaen. Sandnes is the only city in Norway which is a member of the World Health Organisation’s network of Healthy Cities. Sandnes is the home of professional poker player Annette Obrestad, who was born in Stavanger, just 9.3 miles away. Annette became the youngest ever winner of a WSOP bracelet when winning the Betfair World Series of Poker Europe title in September 2007 at the age of 18. Sandnes and its neighbor city Stavanger has been chosen along with Liverpool, United Kingdom, to be a European Capital of Culture for 2008. Thomas Dybdahl, famous Norwegian singer/songwriter is from Sandnes. The winner of Norwegian Idol 2004 was Kjartan Salvesen from Sandnes, whose first album sold 40.000 copies in Norway (double platinum). The Concept Hotel Gamla Vaerket is located in Sandnes, Norway, 50 metres away Sandnes railway station, 300 metres away from the largest shopping street in Norway, Langgata, and 14 kilometres from Stavanger city. Decorated in a modern style with rustic details, this hotel is set in a historic Norwegian tile-works building. Internet access is available in all the public areas of the hotel. There are conference rooms with audio-visual equipment, each of which has a maximum capacity of 80. Fresh bread is made every day in Concept Hotel Gamla Vaerket's on-site bakery. Norwegian dishes made from local produce are served in the hotel restaurant, which offers a complimentary buffet breakfast each day. The Kronen Gaard Hotel is located in Sandnes, Norway, three kilometres away from Vitensenteret science museum, and ten kilometres from the porcelain factory in Figgjo village and the city of Stavanger. This family-friendly hotel is built in a Swiss style and set in private gardens. The front desk is open 24 hours a day and has a safe-deposit box. The hotel's onsite restaurant serves speciality Sunday dinners. A complimentary breakfast is available every morning, and 24-hour room service is offered. The Kronen Gaard Hotel has 35 guestrooms; amenities include televisions, telephones, wireless Internet access, and private bathrooms with hair dryers. Thon Hotel Sandnes is located in Sandnes, Norway, 100 metres from Gandsfjorden and three kilometres from AMFI Vagen shopping centre. The central bus terminal is three kilometres away. Guests are offered a fitness room, sauna, a complimentary sessions at a fitness centre nearby. Complimentary onsite parking is provided, and there are multilingual staff at the 24-hour front desk. Thon Hotel Sandnes offers a complimentary breakfast each day, and the modern restaurant serves a menu of daily specials. Conference rooms come with audio-visual equipment and there is complimentary wireless Internet access throughout the hotel. The 82 guestrooms all have complimentary wireless Internet access, satellite television, minibars, coffee and tea facilities, and hair dryers. Skien is a city and municipality in Telemark county, Norway. It is part of the traditional region of Grenland. The administrative centre of the municipality is the city of Skien. Skien is also the administrative centre of Telemark county. The municipality of Skien was established on 1 January 1838 (see formannskapsdistrikt). The rural municipalities of Gjerpen and Solum were merged into the municipality of Skien on 1 January 1964. Telemark Museum is located in Skien. Skien was the birthplace of the author and playwright Henrik Ibsen. At Venstøp in Skien, you can find the Venstøp Farm, established as the Ibsen Museum in 1958. 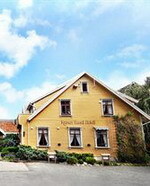 We are a special hotel offering charm and atmosphere in a traditional style, with deep chairs and chandeliers. We offer some of the best cuisine in Telemark, and our comfortable restaurant with cut glass chandeliers and modern table settings really rounds off the experience. Our wine list is excellent, as is our menu. We serve lunch from 12 am to 2 pm from Monday to Friday, and our á la carte menu from 4 pm to 10 pm every day, except Sunday. We have a range of delicious party menus to offer large parties. Following a delicious meal, you can relax in our comfortable lobby bar, or drink coffee in the fireside lounge. Attractions and other things to do at the hotel. 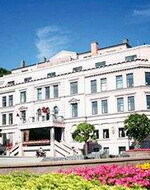 The hotel forms an excellent base for activities in Skien and Telemark. The hotel is within easy reach of the Telemark Canal, Telemark Museum, Henrik Ibsen's Museum, Brekkeparken and nightlife and shopping in Skien. You can also play golf or try boat trips. The hotel can also organise a ghostly evening in our own haunted lounge. Tønsberg is a town and municipality in Vestfold county, Norway. The administrative centre of the municipality is the town of Tønsberg. The town of Tønsberg was established as a municipality on 1 January 1838 (see formannskapsdistrikt). The rural municipality of Sem was merged into the municipality of Tønsberg on 1 January 1988. The population of the entire urban area, regardless of municipality borders, and following the guidelines set by Statistics Norway, was 46,862 as of 1 January 2008, making Tønsberg the tenth most populous urban areas in Norway. Tønsberg is generally regarded as the oldest town in Norway. 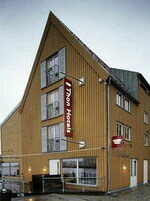 Thon Hotel Brygga is perfectly situated at the harbour in the very heart of Tønsberg, overlooking the sea. Park your car just outside the main entrance, or moor your boat to the docks. The district offers many cultural events, museums, beaches and cliffs. 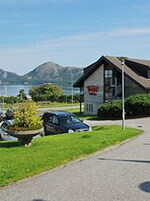 The hotel’s Restaurant Måken serves tempting à la carte dishes and its speciality dishes. The restaurant also has an entrance from the seafront, and can offer refreshments and delicious meals on the waterfront throughout the summer. The hotel bar is the hotel’s natural gathering point, to meet for a drink or a bite to eat – or just to relax with a newspaper. Tønsberg is renowned for being one of the best places to be in Norway in the summer. Thon Hotel Brygga is located on the Brygga waterfront in Tønsberg town centre, and it is close to shops, beaches and the Slottsfjellet hill. 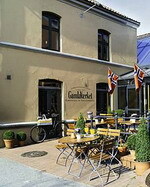 The hotel is also well placed in relation to nightlife, bars and restaurants in Tønsberg town centre. 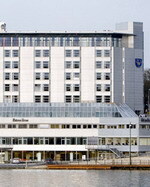 Thon Hotel Brygge is certified as Eco-Lighthouse.